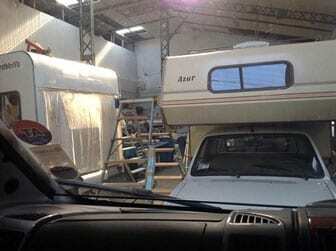 We parked our motorhome easily in one of the car parks in the centre of town as we didn’t expect to be there too long. As it happened there was plenty to see and we stayed longer. 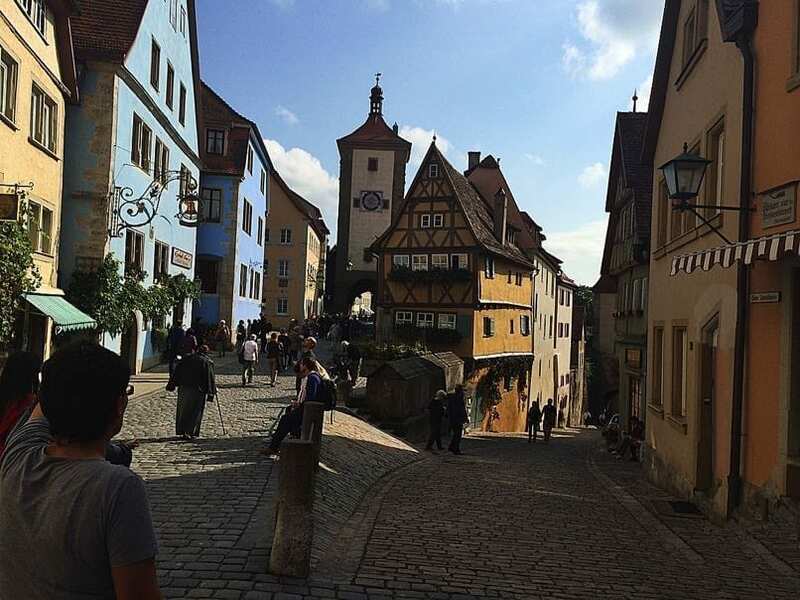 Walking through the town was a bit like walking into a fairytale storybook. A place, I know, the kids would love. There were about 7-8 shops just dedicated to cuckoo clocks all within a few metres of each other on the high street. As well as the clocks there were lots of wood carved figures and handicrafts. This is a very large shop which takes up an entire two storey building. 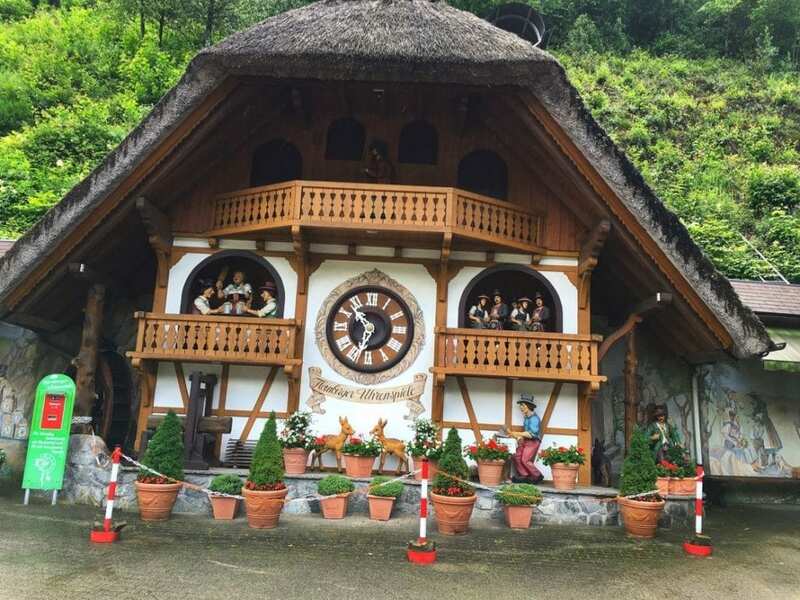 It is FULL of many different types of interesting and unusual cuckoo clocks on display as well as other wooden crafts and toys. The shop is more like a museum dedicated to the story of clock making. So many clocks and all different and colourful. It certainly was a fantastic experience. 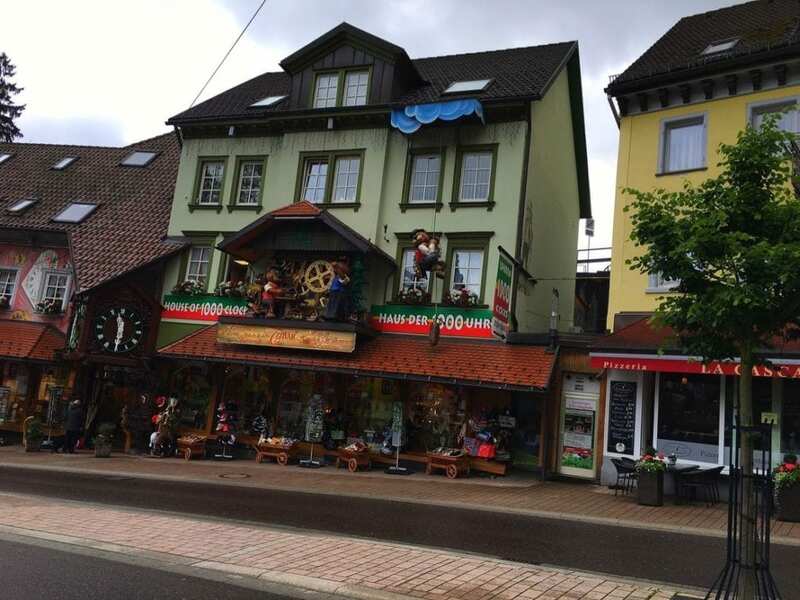 On the outside wall of the shop is a clock which consists of a family of bears climbing around the building. A large bear on a rope is constantly climbing up and down. 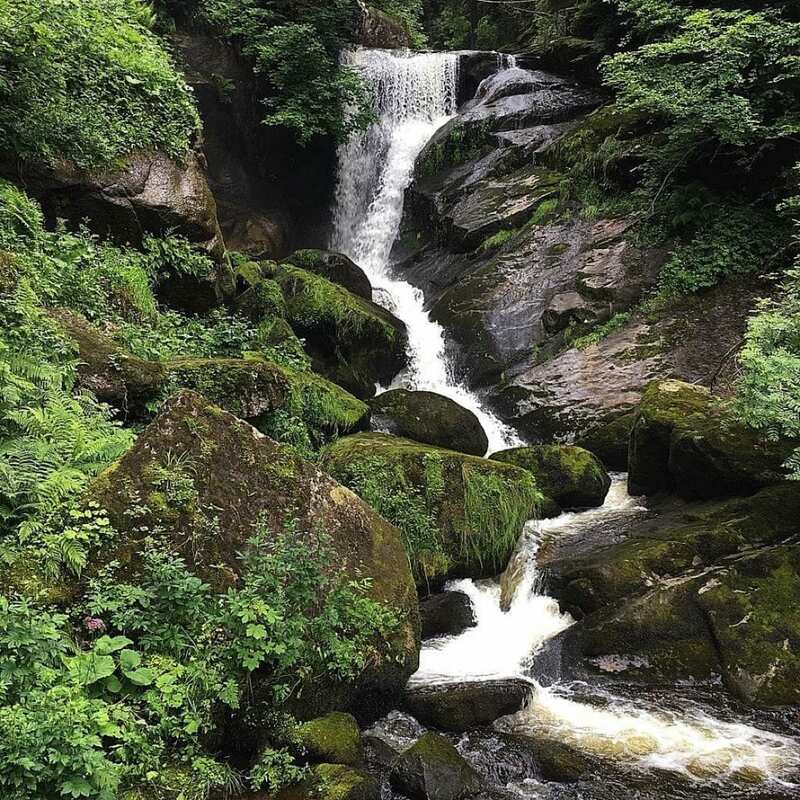 (or Triberg Wasserfalls) are situated at the top end of the town so they are very easily accessible. 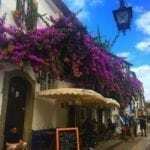 If you are visiting the town it’s worth a visit as they are beautiful. Some of the waterfalls that cascade down have a bridge that takes you right in front of them. There are 3 colour coded routes/paths of different lengths and difficulty for you to follow and none of them are too hard. The majority of the path is smooth (fine gravel to asphalt) and is easily accessible with pushchairs. 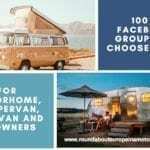 Plenty of rest spots line the routes which are great for just relaxing and taking in your surroundings. You can watch the red squirrels and purchase peanuts for one euro to feed them. The best views are at the very top of the falls. The stroll through the forest to the lake is very enjoyable. 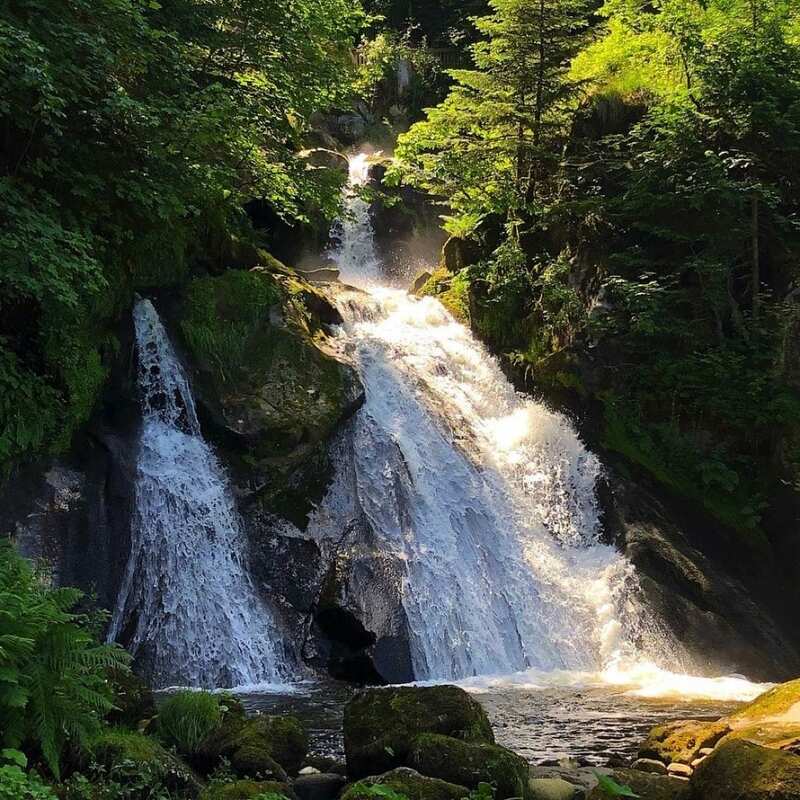 There is an entry fee to enter the falls, however, It is free to those staying in the Triberg hotels, and you receive a special pass a KONAS card, which enables you entry to some of the attractions and free local trains and buses. 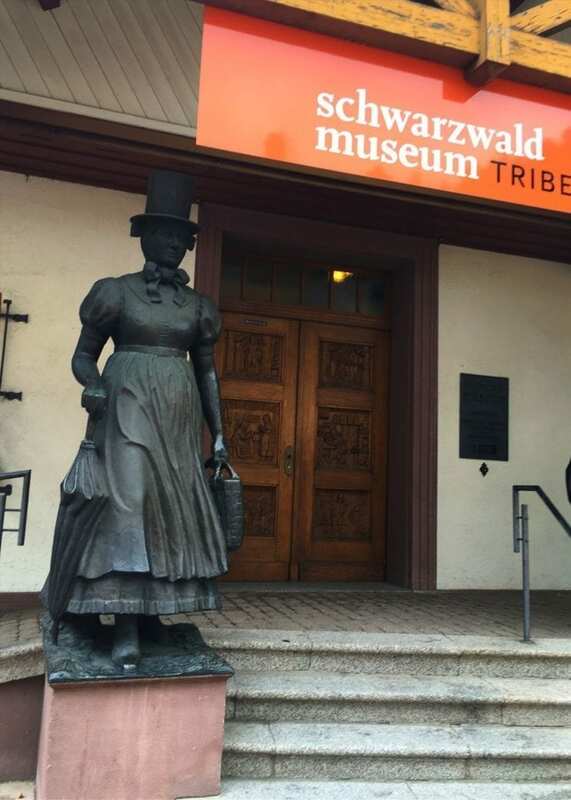 Just across the road from the waterfalls is a very interesting, colourful museum that offers an insight into the history of life and work in the Black Forest. 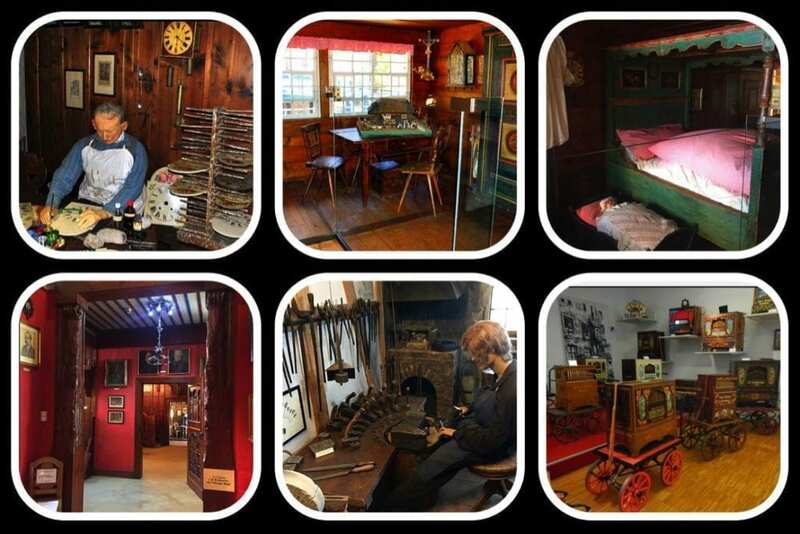 The museum has a huge variety of exhibits some of which are in working order and can be tried out like the unique display of barrel and fairground organs. Take some change with you and you can listen to some of them play a few tunes, light up or move. 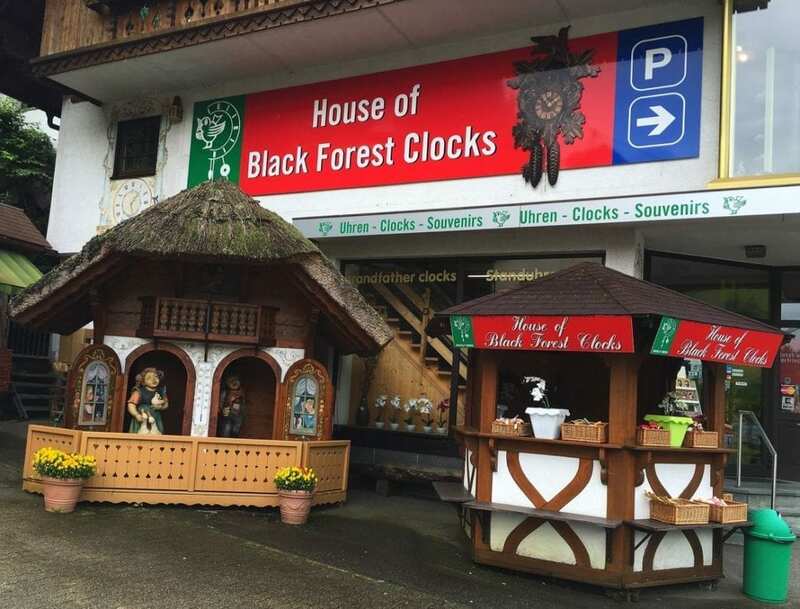 There is a great selection of historic Black Forest clocks of all shapes, sizes and sounds from 4 different centuries. 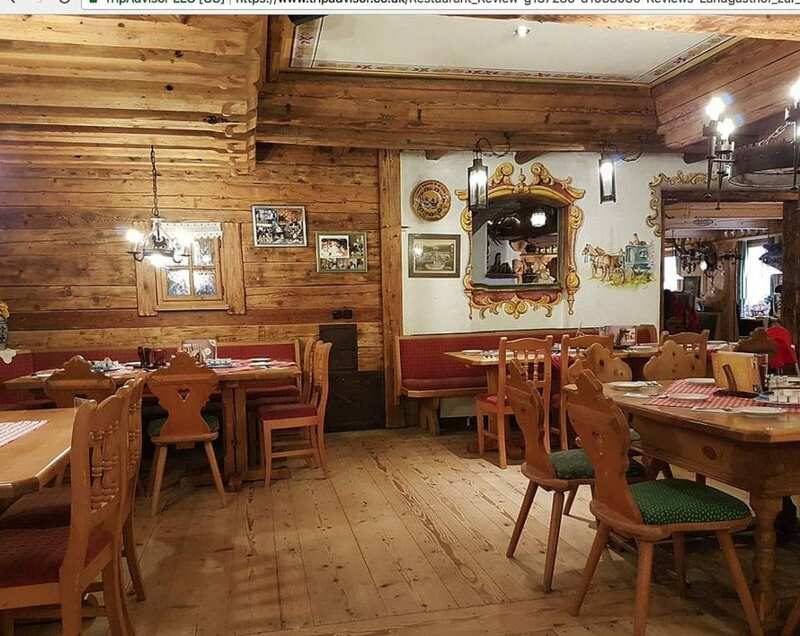 A crystal collection can be viewed by going into a little ‘mine’ and you can see a working model of the Black Forest railway laid out in a room. Exhibits include traditional costumes, carved wooden objects, straw braiding, clock making and glass making. Many items are displayed in a room setting depicting the lives of residents in the olden days. The displays are visual and practically self-explanatory which is good as the descriptions next to the exhibits are all in German. You do however get a leaflet in English that gives brief descriptions of the different rooms in the museum. There is a café on site and a shop where you can buy souvenirs of the region. Unfortunately, the museum is not suitable for the disabled as there are a lot of stairs. 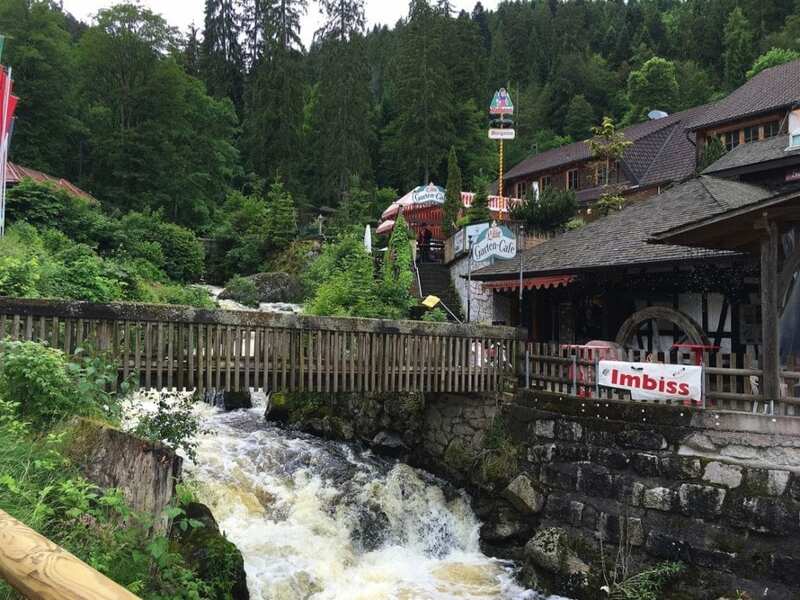 We had lunch at the Landgasthof Zur Lile restaurant which is next to the waterfall entrance. 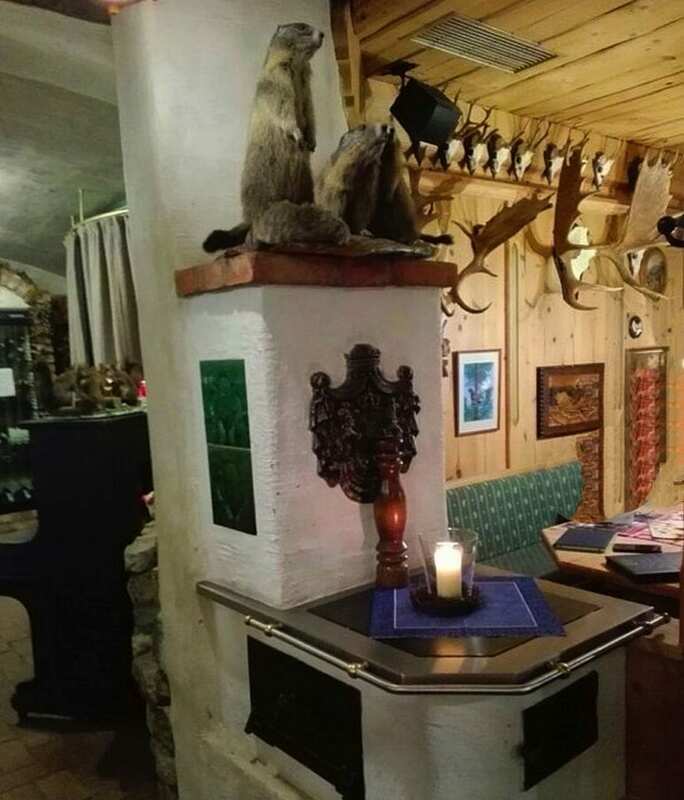 It’s a nice cosy restaurant and I loved the decoration it was interesting just sitting looking around us at the unusual decoration. The food was excellent too. We finished our meal with the black forest gateau covered in a lovely locally made cherry schnapps. 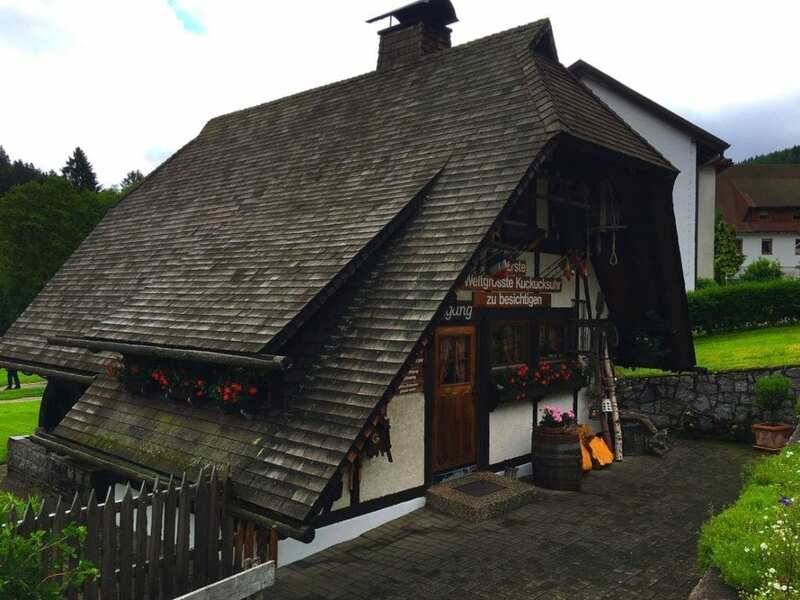 A visit to the Schinkenstrasse is a must if you are looking to try some Black Forest edible souvenirs. 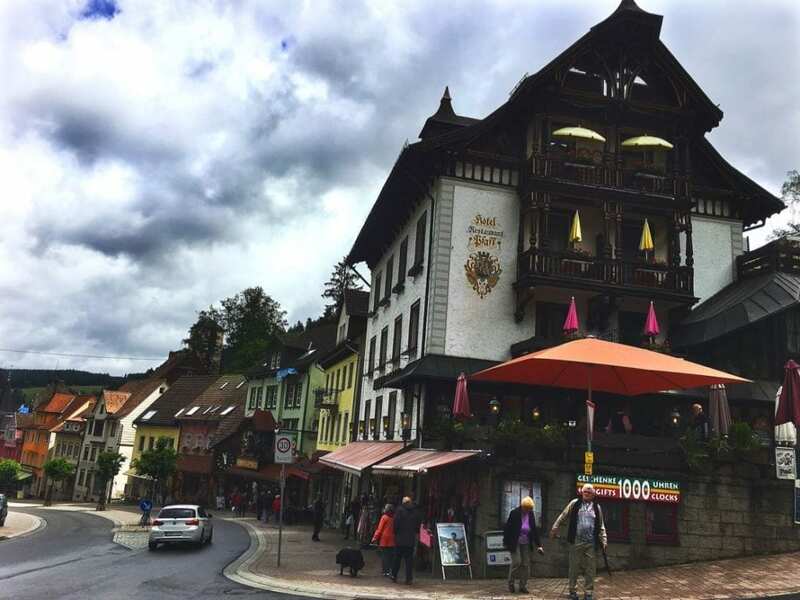 We found Triberg’s famous version of Black Forest ham Triberger Fichtenschinken (which is our favourite) another name for it is Triberg spruce ham. The ham is flavoured by the earthy spruce trees that are in the area. It certainly is tender, juicy and moist. Other products made in the Black Forest which were on our shopping list was a ring of black sausage, ham mousse and blueberry jam. 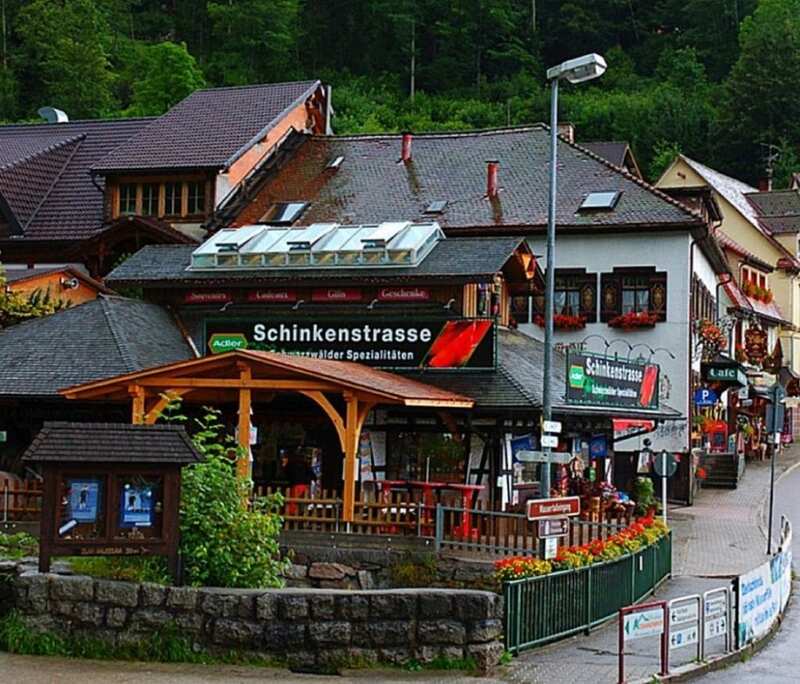 After seeing all there was to see in the town we got back in the Motorhome and drove 3 kilometres to Schonach. 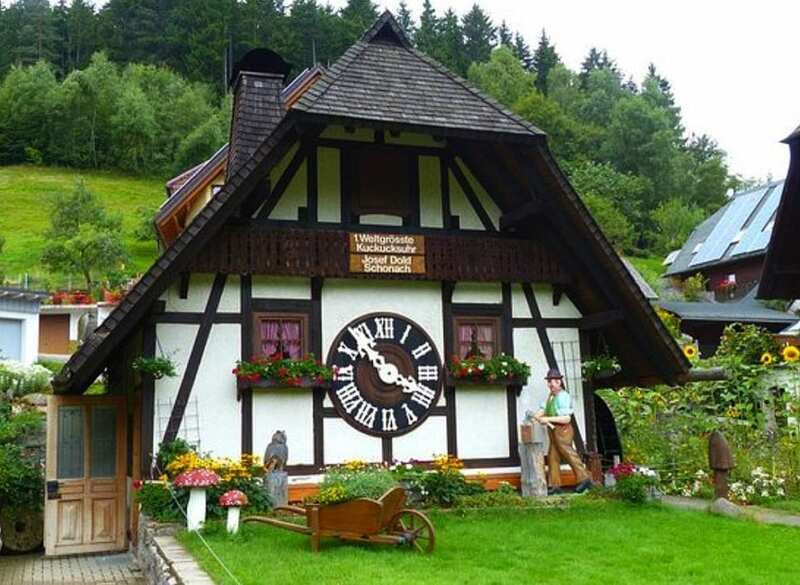 Here is the world’s largest cuckoo clock. We actually missed it on the road first time round and had to turn round and go back as it’s nestled between houses. We didn’t realise that the clock is an actual building. 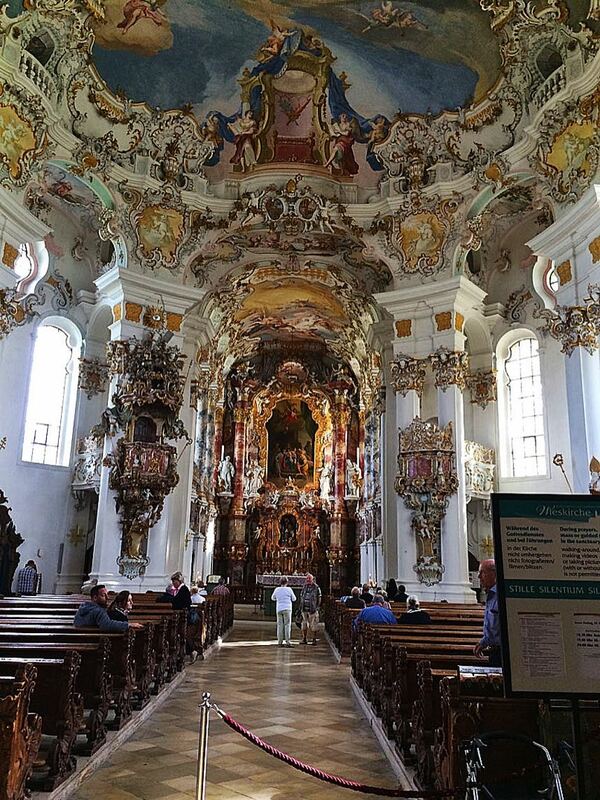 Our next stop was six kilometres away at Schonachbach. This clock is even bigger. The bird weighs 149kg and was built in the traditional Black Forest way. 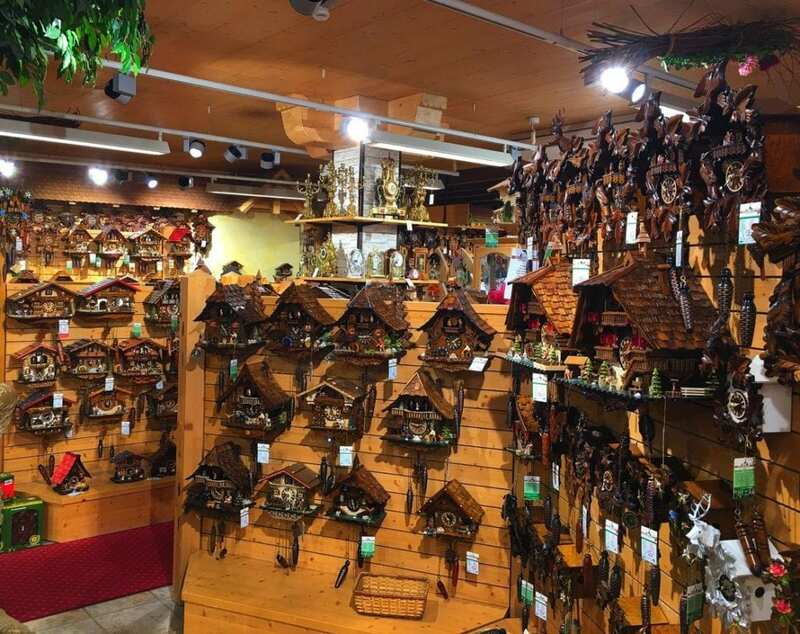 Here too you can find a large variety of cuckoo clocks, from traditional to contemporary, along with clothes and other Black Forest products and souvenirs. 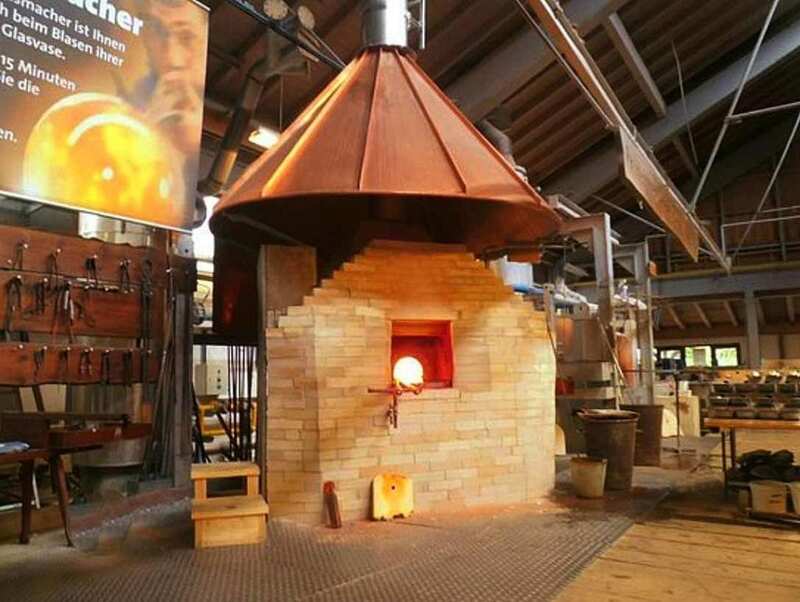 You can visit the glass blowing factory and watch the glassblowers busy at work making glass art and vases. It’s quite an experience watching the artisans blowing the glass next to the kilns in front of you and making beautiful glass objects. For a small fee of approximately 15 euros, you can make your own vase. You start it off by choosing the colour and pattern then blow it out into its shape before the expert glassmaker finishes it off for you. There is a small museum along with a large gift shop and a beautiful permanent Christmas market which is nice to browse around. The best time to visit is in the morning before all the tour buses arrive. 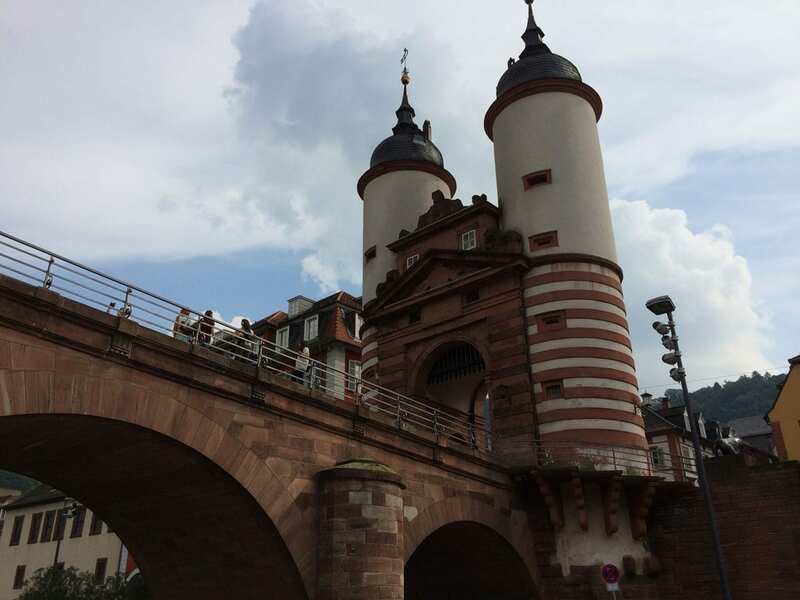 There is no direct train from Strasbourg to Triberg, however, there are services departing from Kehl and arriving at Triberg via Offenburg. The journey, including transfers, takes approximately 1 hour 32 minutes and costs £23 – £35. The train services are operated by Deutsche Bahn. Another major airport is Baden Airport (FKB/EDSB), which has international and domestic flights from Baden-Baden, Germany and is 102 km from Triberg via A5 and B33 taking 1 hour 31 minutes by car. Check out the prices with Cheapflights UK who fly from many places around the UK including Stansted. The train journey is direct and takes 1 hour 15 minutes costing €10 – €28 and again is operated by train operators Deutsche Bahn. 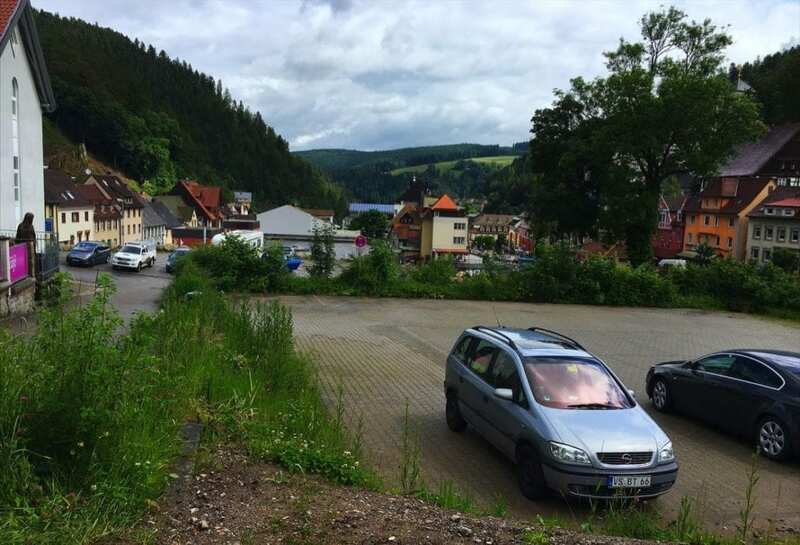 The distance from Calais to Triberg is 701 km via A26 and A4 taking 6 hours 44 minutes. 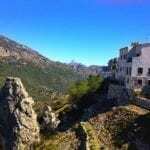 GPS: N48°6’2” E8°3’5” 19€ per night.